Mark Meadows said it would not be punting the problem but fumbling the ball if the government were funded without border security. This is the last play before possession is turned over to Pelosi. Then, Mattis’ resignation letter explains that he was always a globalist, never for America First. But he’s been exploring running against Trump in 2020. 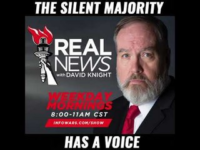 And, Mark Hall joins to talk about the Islamic school network that’s getting $750M in taxpayer money and the CIA’s favorite Imam who’s running it.